The Tibetan faithful at Jokhang Temple, Lhasa. Prayer beads are used by both Theravada and Mahayana Buddhists. The use of prayer beads, or japa malas, in both Buddhism and Hinduism speaks to a historical connection between the two faiths; however, Buddhist japa malas typically contain a lesser number of beads than the Hindu japa malas’ 108 — it is usually a divisor of 108. There many potential explanations for the significance of the number 108, however, none alone appears offers a definitive explanation. The beads are typically made from the seeds or wood of the Bodhi tree (a.k.a. “ficus religosa” or fig tree; this is the tree under which the Buddha gained enlightenment) and are typically used as counters, thereby enabling the faithful to keep track of recitations of mantras or prayers, prostrations, circumambulations and so forth. The large bead on the strand is symbolic of the wisdom that allows one to recognize emptiness (sunyata) and the bell-shaped bead surmounting it is symbolic of “emptiness” itself (the bell is always a Buddhist symbol for emptiness; its ringing is the sound of emptiness). A few words on Buddhist philosophy: “Emptiness” signifies that everything one encounters in life is empty of absolute identity, permanence, or an in-dwelling ‘self’ (anatta). All things are connected and mutually dependent, in a constant state of flux, transforming and becoming (rather than self-centered and fixed). The Buddhists believe that only when this abandonment of “self” occurs can the transcendent state of enlightenment be achieved. A mantra is said as each bead is spun (in turn) in a counterclockwise direction (similar to circumambulation of the stupa). The rotation through the beads is also typically done in a counterclockwise motion beginning at the first bead after the large central bead. This large bead is used a counter, signaling that one full rotation of the beads (108 mantras) has be achieved. This process is of 108-bead cycles is repeated countless times. Vegetarian Thali. Image by GracinhaMarco Abundo. Thalis are one of the most delicious and inexpensive dishes that you will encounter throughout your travels in India; however, they can be intimidating if you don’t know how to eat them. Our friend, Surya, generously gave us a few lessons in how to approach eating thalis – we hope that this guide helps you as much as it did us. Enjoy! The thali is typically served on a round plate (or more traditionally, a banana leaf), with small bowls (including vegetables, curries and curd) lining the periphery; in the center of the plate is places a heap of plain rice, which is replenished as you move through the meal. Although thalis can now be found in the north and south of India, the thali (Hindi for “the plate”) has its origins in South India, given its orientation around rice (as compared to the north’s orientation around wheat). Fingers, please… A thali is traditionally eaten with your fingers, and only with the finger of the right hand, specifically. Use your left hand only for pouring the curries onto your rice and to grasp your drinking glass. Rice is central to the dish. The rice sits in the center of the plate; you divide off a portion of the rice and place the different curries or vegetables on top of that portion (rather than pouring the sauce over the top of the whole pile of rice on your plate). Mix the sauces in with the rice with your fingers to get a good spread throughout the rice. 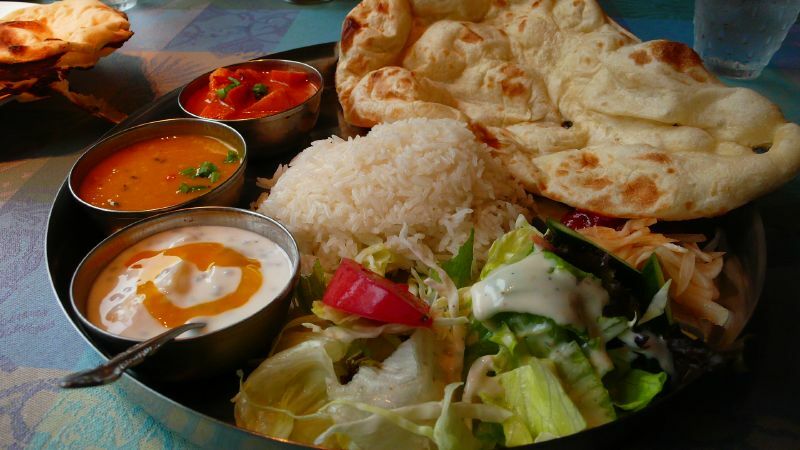 Begin by eating any of the vegetables (in both curries and dry form) on the plate. You can also eat the vegetables throughout as an accompaniment to the rice and sauce courses to follow. The fiery lentil-based vegetable sauce called “sambhar” is next to be eaten (it is added to a portion of rice as you desire). The chili- and tamarind-based “vathal kozhambu”, the spiciest of the three sauces, is eaten next with rice. Note that this sauce is not always given. The “rasam”, mixed with rice, is always eaten last of the sauces. It imparts a tomatoey and peppery palate. Curd (yoghurt) mixed with rice is always eaten last, to cool your palate and aid with digestion. The roasted dry chili can be added for balance. There is sometimes a sweet for dessert added as well. Then again, you could just wing it! Just pretend like you know what you are doing and all will be well….Enjoy! Going to India? Explore India’s art and architecture with our downloadable travel guides to India. Travelers to Buddhist and Hindu countries might find a review of AUM valuable, as it exemplifies many of the fundamental tenets of these faiths. The large curve (the lower left corner of the image) symbolizes the waking state. Perhaps it is best to think of this curve as symbolic of the ego, our outward persona, the person we think we should be, that identity that we consciously associate with the self. Moving clockwise, the upper curve (upper left corner) symbolizes the unconscious state, that part of the self that is hidden to one’s consciousness, but is equally part of the self. The middle curve, which extends from the center to the right side, symbolizes the dream state. This dream state, positioned vertically between the conscious and unconscious elements of the self, serves as a means to connect the two, a means for the conscious and unconscious to interact. This is certainly what we do when we dream: the unconscious becomes conscious, affording a more complete view of the self. The semicircle or crescent (upper right corner) symbolizes illusion, specifically in this case, the illusion that the self exists as a separate entity at all. Notice that the crescent separates the dot from the other three curves. It is this illusion that separates the individual from becoming one with his infinite self, beyond boundaries. The dot signifies the infinite, absolute self, hidden from the individual by illusion; this is what the Eastern faiths of Hinduism and Buddhism consider God. Dispelling the illusion and becoming one with this infinite self is the ultimate experience of life and the experience of the divine. The A representing the realm of waking experience: “cognitive of the hard gross facts of an outer universe, illuminated by the sun, and common to all”. The U representing the realm of dream experience: “cognitive of the fluid, subtle forms of a private interior world, self-luminous and of one substance with the dreamer”. The M representing the realm of very deep sleep: “dreamless, profoundly beautiful” (the person unified with the unconscious and the greater self). When in India, seeing a tiger in the wild should be a priority on any traveler’s itinerary. And India’s centrally-located Madhya Pradesh province holds two of the best places to see them. After viewing the stunning Islamic architecture of Delhi and Agra or visiting the amazing Buddhist and Hindu caves of Ellora, Ajanta, and Elephanta, take a quick flight to Kanha National Park or Bandhavgarh National Park (outside of Khajuraho). There are only two wildlife parks in India that offer you the opportunity to ride into inaccessible (by car) areas of the park on mahout-driven elephants to view tigers up-close during the day (this is called a “tiger show”): Bandhavgarh and Kanha. 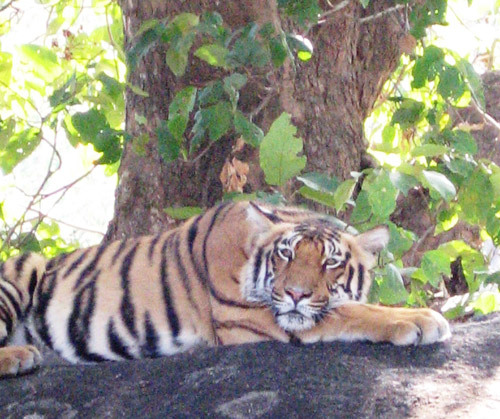 In addition, both parks have a large tiger population, making them the two premier spots in India for sightings. The tiger is the largest of all thirty-seven species of wild cats. Along with the lion, the leopard, the snow leopard and the jaguar, the tiger is classified in the genus “Panthera”, which comprises the group of big cats that are capable of roaring, due to a modification of the hyboid bone. India is home to over half the world’s tiger population (this estimate was given to us by researchers at Kanha). As of March 2011, the current tiger population is estimated at 1,571-1,875 (the subspecies specifically being the “Bengal Tiger”), with the greatest concentration thereafter being in Southeast Asia (there are no tigers in Africa). Tigers are the only big cats with stripes. The stripe patterns on each tiger, designed for camouflage, differ on each side of its body. Males weigh 400-500 lbs and females 220-350 lbs. Tigers are successful in 1 out of every 10-20 attempts to stalk and kill prey. Tigers kill their prey with either a bite on the back of the neck that serves to sever the spinal column or a bite on the throat that serves to suffocate its prey. An adult tigress needs to kill a fair-sized prey (200 lbs) 40-50 times per year, or every 7-8 days. Tigers possess two sensory enhancements, neither of which is unique to this species: the tepetum lucidum, a reflective patch in the retina which improves vision in low light conditions; and the vemeronasal organ (VNO), sometimes called Jacobseon’s organ, which is located in the roof of the mouth. The use of the VNO is most obvious in the grimace known as flehmen, in which the animal wrinkles its nose and extends its tongue; the VNO is designed to evaluate the sexual receptivity of females. Tigers have evolved as basically solitary animals (as compared to lions that exists largely in group formations). Both males and females are territorial and have specifically staked out areas in which each animal pursues prey. Females nurse cubs for 20-24 months; gestation period of 105 days; average litter of 2-3 cubs, with high mortality rate (34% in first year, 17% in second), the most common reason for death being infanticide, the killing of the cubs by a new male looking to mate with the mother tiger. Poaching is still a real problem, particularly because elements of the tiger are still in demand for traditional Chinese medicine. Hotel. Kipling Camp. 07649/277218. www.kiplingcamp.com. Although it is far from luxury and a bit expensive, this is the quintessential (and first) camp in the area, to the best of our knowledge. It is located right outside of the entrance to Kanha. The camp appears to suffer a little from a staff turnover issue, however, it is more than adequate. You are here to see tigers and they maximize your experience on this front, running a morning and afternoon game drive led by experienced naturalists. Enormous wooden structures resembling a Hindu temple on wheels are designed to carry images of a deity through the streets during major festivals. In the weeks leading up to the festival, a team of professional chariot builders are brought in to build these chariots from scratch. In this episode of Approach Guides’ On Location series, we take you behind the scenes to watch the fascinating process of chariot builders constructing a Hindu wooden chariot in Puri, India (Orissa).